Captain Danny is knowledgeable and fun. He keeps you apprised of water conditions and provides historical info. Safety is number one priority for Danny and his crew. The Na Pali coast is magnificent. Definitely recommend this tour. The food was even very good. Thanks Danny, Dane and Stacey. We traveled to Kauai for my husbands 50th with our great friends. They told us the water conditions weren't perfect and if we anyone wanted they could change for a different date. We stayed and had the best time on the water. They scenery was breath taking, Captain Ben, Cole and Nate. All kept us comfortable with snacks, drinks and took pictures of us when we asked. Ride up was fun due to the chopping water and swells. On the way back smooth and we ate a buffet of pork, chicken, rice, salad/rolls. The drinks were then flowing and everyone had a great time visiting. Captain Ben turned the boat towards the sunset and we were all given a glass of champagne and toasted while we watched the most beautiful sunset set into the water. 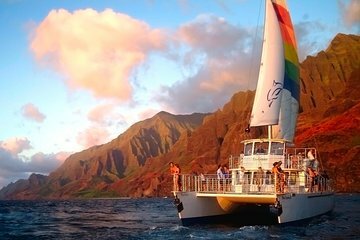 We then headed back to the dock to end our amazing Na Pali Coast Sunset Dinner Cruise. Loved the trip! This is no relaxing boat cruise. 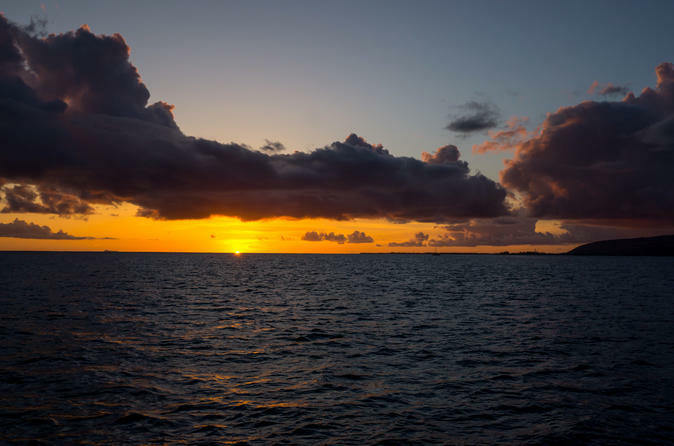 If you are prone to seasickness -even a little, then this trip is NOT for you. Yes I was expecting some roughness (the open seas after all ). But nothing like this. At the onset we were told the ocean conditions that day were average (not extraordinarily rough). (*What? *)Spent a good part of the trip getting sick (over and over). Too sick to barely look up. There are numerous parts of the journey where the boat is violently rocking every which way in rough bouncing waters. As well (if you don’t mind of course ) you will most undoubtedly get soaked. You might manage to stay dry in the cabin ( which has absolutely NO air flow) Hence was utterly suffocating due to the intense tropical humidity. When buffet time came many were much too sick to eat. The food (which of course you had to eat on your lap in the rocking boat) appeared just ok. I give this trip two stars only because the crew was efficient, knowledgeable and helpful, (in particular with handing out “bags” to everyone who was getting sick ..I would say about half the passengers )!In conclusion, the Na Pali coast and Sunset views were “spectacular” but unless you are one of those lucky people who are immune to sea sickness, you will be miserable the entire journey and miss the payoff. I simply feel that the actual (typical ) sea and boat conditions should be better conveyed in advance of booking so people fully understand what they’re going to be dealing with. Chloe, Matt and Capt. Cole. Can't say enough good things about this crew. My wife and I are both handicapped and Chloe and Matt were amazing. Constantly asking us if we needed anything. Capt. Cole was extremely well informed and was a pleasure to listen to as he pointed out interesting points during the cruise. This was nothing short of amazing! The boat ran fairly smooth through the waves due to its size so it was a very comfortable ride. Our captain Chad was great, and kept us entertained with stories and songs, as well as lots of history about different parts of the coast. The crew was extremely friendly and helpful. The food was fine, but that's not why you are on this cruise. The scenery was absolutely breathtaking, both from a short distance and up close Chad put the front end of the boat under a couple waterfalls!. At the end of the night as we were approaching the harbor, Chad stopped the boat and pointed it west. The sunset was unbelievable. We highly recommend this cruise! Did not make the cruise, thus can not rate! We are unable to see the Na Pali Coast because of weather conditions. However, we were able to see dolphins, turtles, whales and some great coast line with a sunset. The crew was great, very informative and a lot of fun. We loved this cruise! What made it so memorable was our Captain and crew. Captain Danny, Safety Officer Sullivan and Whitney were so kind, funny and passionate about what they do, you could not help but enjoy yourself! The cruise itself was very enjoyable, but we were very lucky. The winds were calm and seas were not rough. That said, there were still several passengers that did get sea sick, so please, if you have any chance of getting sea sick, take medication prior to boarding!! I can't imagine a cruise with normal winds and seas!! We were so very fortunate to see several whale sightings and dolphins! This was a highlight for us. The scenery of the Na Pali Coast is gorgeous but it is sad that the waterfalls are now extinct due to the all the previous diversions for sugar plantations. One can only imagine how gorgeous it used to be! All and all, this is one cruise not to be missed! This dinner cruise was terrific. Beautiful scenery, saw some whales and turtles. The crew were fantastic. They showed every precaution to make the trip safe for us. My Grandaughter got seasick and they were most attentive and helpful. The captain provided us with history of the area and interesting stories. I highly recommend this tour.